The on-board speaker on a cell phone can only be so powerful, but external speakers can provide a much larger and fuller sound. Having the right external speaker to go along with a cell phone is a critical decision for any music lover, whether they're listening to tunes at home or taking the jam on the road. Many external speakers feature a standard 3.5mm stereo audio input jack; this can be used to connect the speakers to nearly all contemporary mobile phones the same way you would connect a set of headphones. This universal connectivity means that wired speakers will work with just about any mobile phone. If you enjoy listening to music stored on your cell phone at home or your office, the experience will be even more enjoyable when you have a great speaker to amplify the sound. The Audioengine A5+ comes as a pair of premium powered speakers to suit a variety of musical styles and genres. Designed to work with a variety of iDevices like the iPhone, as well as with other smartphones, TVs, computers, or any other audio source, the A5+ provides great stereo sound to any room in your home. In addition to the pair of bookshelf speakers, the A5+ also features a remote control and a USB port to keep your smartphone charged while it is playing music through the provided auxiliary input jack. 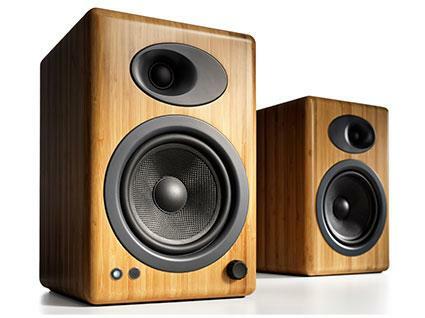 Pricing: The black or white versions of the A5+ speakers have a retail price of $399, while the bamboo version costs $469. Pricing: MSRP on the Soundsticks III is $170. 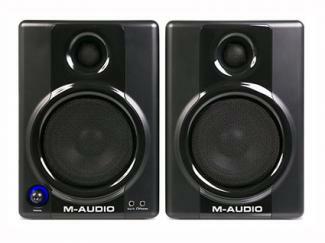 Providing a similar studio-like experience for audio aficionados, the M-Audio Studiophile AV 40 compact powered speakers provide a total power output of 40 watts, with 20 watts per channel. The speakers feature four-inch polypropylene-coated woofers and 3/4-inch silk dome tweeters that are ferrofluid-cooled. The magnetic shielding virtually eliminates any interference and the built-in volume dial on the front makes it easy to adjust the sound. Conveniently, the 3.5mm stereo input jack is also located in the front, making it easy to connect your phone. Pricing: The retail price on the M-Audio AV 40 is $200. If you're looking for a pair of stereo speakers that make a statement, the Edifier Exclaim e10 Bi-Amped 2.0 speaker system could be a fantastic choice. The base of each of the stereo speakers is spherical in shape, containing the main three-inch woofer, while the vertical upper sections contain two one-inch tweeters and a 1x3-inch passive radiator for added sound production. The full integral digital sound processing provides excellent performance for any general of music with a total RMS output of 36 watts. Pricing: The Edifier Exclaim e10 is listed at $100. The larger options above are best suited for the home or office, but it is also possible to carry around a smaller, portable speaker for sharing music on the go. Not all speakers have to be flat boxes or cylindrical towers. 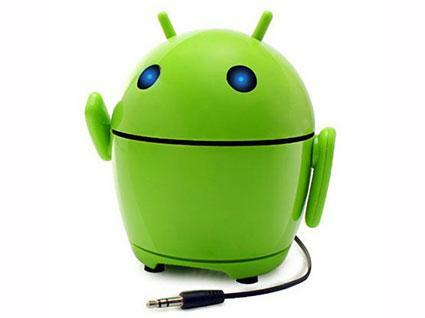 The GOgroove Pal Bot is a portable sound system that takes on the appearance of the Google Android character. Some people call him Andy and others refer to him as Bugdroid. In any case, the cute Android robot acts as a full-fledged speaker for your smartphone and it will even work with iPhones, Windows Phones, and other audio sources. At lower volumes, the battery can keep the music going for over 24 hours and the retractable audio cable keeps everything neat and tidy. Pricing: Whether you go with the official-looking green or a less conventional blue, the GOgroove Pal Bot retails for around $40. An extremely affordable speaker that happens to be remarkably small too, the Scosche boomCAN comes in a number of different colors and features a rechargeable battery for up to 7 hours of continuous music playback. It measures less than two inches wide and under 2.5 inches tall, making it one of the smallest portable speakers for cell phones. The aluminum housing is lightweight, while also providing good durability. You can even link together multiple boomCAN speakers via the audio output jack for even bigger sound. Pricing: The Scosche boomCAN is available for around $20. Available in blue, grey, orange, purple or yellow, the HMDX Burst portable speaker features a convenient, retractable 3.5mm cord for connecting to your music-playing cell phone. The retractable cable is very convenient, as you don't have to bring along a loose audio cable. The rubberized soft exterior provides some protection and the rechargeable battery can last up to six hours. Pricing: The HMDX Burst has a list price of just $25. Geared toward people who value a trendy, fashionable appearance, the Go-Anywhere Mini Speaker features a unique vase-like shape and can be used vertically with MP3 players, smartphones or any other audio source via its 3.5mm input jack. It comes in bold colors like pink magenta, orange and pool (aqua). Pricing: The Go-Anywhere Mini Speaker retails for $25. Perfect for children, the Hi-Koala Huggable Portable Speaker may look like a simple stuffed animal, but portable speakers are integrated into the koala's feet for playing music. The arms can also be bent to "hug" the cell phone or MP3 player, amplifying tunes via the standard wired connection. This speaker is conveniently powered by two AA batteries or via a USB connection. Pricing: The Hi-Koala Huggable Portable Speaker lists for $40. Most modern cell phones come with Bluetooth connectivity and having a wireless Bluetooth speaker can be very convenient. Many of wireless speakers also come with a 3.5mm auxiliary jack for a wired connection as well. Used horizontally or vertically, the versatile JBL Flip is a relatively compact speaker with an easy-to-access auxiliary input jack. This makes it a great wired speaker for any number of cell phones and it comes bundled with a neoprene carrying case for music on the go. As can be expected with smaller speakers, the low-end bass may not be earth shattering, but the rest of the range sounds great for its size. Pricing: The JBL Flip has a regular price of about $120. Mobile phones are fantastic convergence devices that have effectively combined the functionality of so many separate devices, but their compact size has typically limited both the volume and quality of the sound their speakers are able to produce. Fortunately, many external speaker options are available, with selections in all sizes and price ranges. A wired speaker may be the ideal choice for you, or you may find that you prefer a wireless model or even a cell phone dock. Whatever type of speaker you choose, you're sure to enjoy the larger sound.